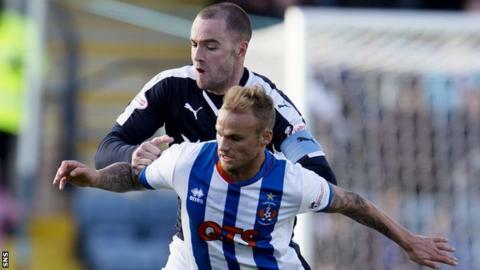 Goalkeeper Jamie MacDonald believes a top-six finish is not beyond Kilmarnock after they claimed successive Scottish Premiership wins. Josh Magennis and Steven Smith were on target as Gary Locke's side beat hosts Dundee 2-1 and moved up to eighth. "I think a top-six place was our aim at the start of the season and it is still the aim now," said MacDonald, 29. "We need to aim as high as possible and we are more than capable of a top-six place this season." When Dundee left Rugby Park with a 4-0 win over Kilmarnock on the opening day of the league season, the knives were being sharpened for Locke. But, 12 weeks on, there has been quite turnaround for the Ayrshire men. New players have bedded themselves in and the team are producing performances that have taken them up the table and potentially into the top half. However, not much has changed according to MacDonald. "There has not been a massive difference in training," the Killie stopper told BBC Scotland. "We are doing the same things now in training as we were then. New players, though, are gelling and there's confidence as well. I think the poor run at the end of last season was still hanging around the club." MacDonald was always confident Locke would come through the troubled start, having previously worked with him at Hearts. "Their was immense pressure on the gaffer," MacDonald added. "There were a lot of people calling for his head. But if we keep winning then we can keep moving forward." Dundee manager Paul Hartley felt his side "were second best for the majority of the game". "We didn't perform," he explained. "It's pretty simple. "We had a little spell in the second half but first half was really a poor, poor performance from us. "The goals that we conceded were avoidable. We've got to do better."